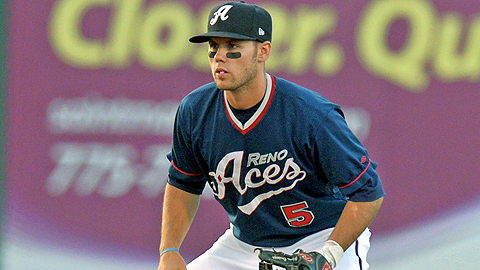 ROUND ROCK, Texas -- Chris Owings of the Reno Aces has been named the 2013 Pacific Coast League Most Valuable Player, the league announced today. Just two days after being named Rookie of the Year, Owings was voted as the 77th PCL MVP in league history after a balloting of the 16 field managers as well as media representatives from across the league. Owings, 22, has played in 120 games with Reno this season and has knotted a .329 batting average, good for third in the league. He leads the PCL in hits (172), runs (98), and total bases (249). Additionally, Owings has 27 doubles, 12 home runs and seven triples to go along with 74 RBI and 17 stolen bases. Owings offensive numbers are impressive, but his glove is equally sound as he leads all shortstops with 332 assists and is fourth with 125 putouts. Selected by the Arizona Diamondbacks in the first round of the 2009 First-Year Player Draft out of Gilbert High School, Owings carries a .290 average over five Minor League seasons. This year he was selected as the PCL's starting shortstop for the Triple-A All-Star game in July, and on Monday, was named the shortstop on the league's All-PCL Team. On Tuesday, Owings became the third straight player from the Reno franchise to be named the PCL's top rookie after Collin Cowgill won the award in 2011 and Adam Eaton took home the crown last season. With the MVP, Owings matches Eaton's post-season accomplishments of last year, becoming just the third player in PCL history to sweep both end-of-season awards (Rob Quinlan, Salt Lake, 2002). Among the others to receive votes for the Most Valuable Player award were Wilmer Flores (Las Vegas), Efren Navarro (Salt Lake), Dean Anna (Tucson), George Springer (Oklahoma City), Michael Choice (Sacramento), Corey Dickerson (Colorado Springs), Brandon Laird (Oklahoma City) and Brock Peterson (Memphis). All statistics are through Wednesday, August 28th.